The Curb Scholars browsed images for free standing door frames, and came up with several ideas. These included suspending the door from a tree, building a triangle frame as seen in theater, using ropes to anchor the door, and staking the door to the ground using metal hoops along three sides of the door. The Curb Scholars fell into two camps—those who privileged aesthetics (integrating support into the theme of the door), and those who wanted to pursue a more practical and functional route. 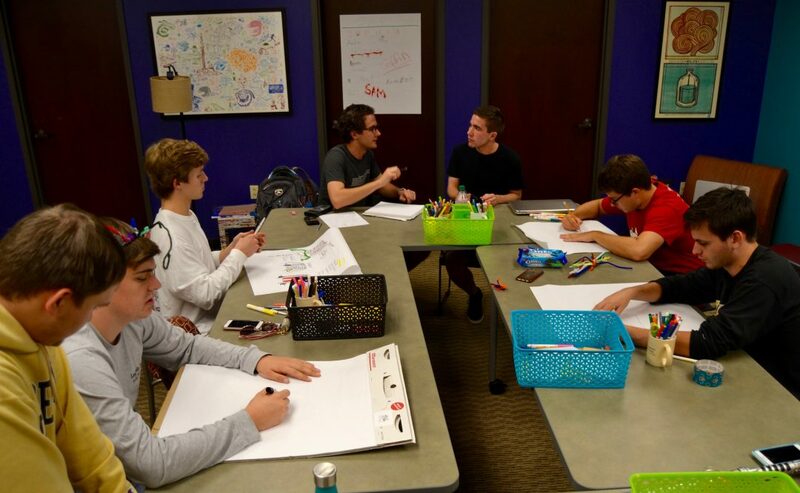 After breaking off into groups and making mock door supports with play dough, pen and paper, and popsicle sticks, the Curb Scholars reconvened to discuss their aesthetic and practical ideas. Every group mentioned the triangle frame, so it was decided that the Curb Scholars will prototype the triangle frame door (and perhaps the suspended door) at the Wond’ry in two weeks’ time. Curb Scholar Riley made an important point at the end: each door leader must scout out their location and determine whether or not the sprinklers will affect their door.